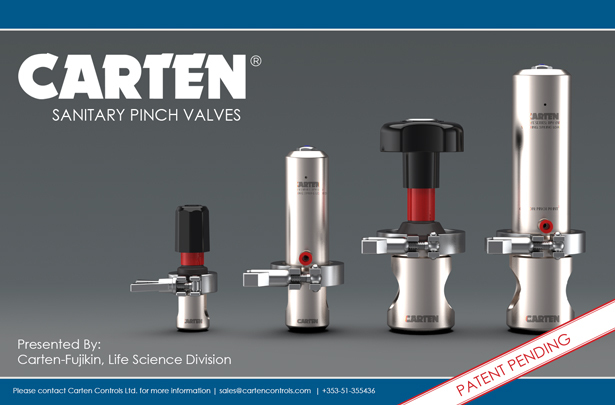 Carten’s BPV Series sanitary pinch valve offers unique advantages over traditional ‘throw away’ polymer components for shut-off single use applications. The valve structure and top works is manufactured utilising polished stainless steel, allowing all tubing brands and compounds to be operated indefinitely from batch-to-batch, with no physical break to the process tubing preventing any possibility of contamination. Single use tubing sizes from 1/8” to 1” ID can be covered using just two differing valve sizes, allowing the end user to interchange just two components whenever a new line size is required. Manual valves provide accurate flow control, with pneumatic top works and instrumentation available as required.